One in four people in the UK are affected by a mental health problem at least once in their lifetime. When it comes to mental health in the workplace, it can be a huge challenge, at least one in six workers are affected by mental health conditions including anxiety and depression. 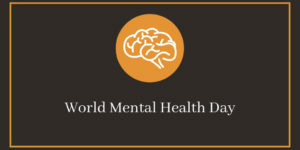 Days like World Mental Health Day have had a positive impact when it comes to the subject of mental health becoming more open in our personal lives, however, the subject is still very much a taboo in professional environments. It can often be a nerve-wracking and stressful topic of conversation at work, so many avoid it. Sometimes it can be difficult to talk, but as a human, one of our fundamental needs in life is feeling close to someone. This need being fulfilled contributes to the overall wellness of our minds, no matter what age you are, social relationships are critical for well-being. Instead of putting your headphones in whilst working, take a few minutes to ask about your colleagues, instead of sending an email, why not go and talk to them? And ask about someone’s weekend – and listen when they tell you! Across all age groups, physical activity is associated with much lower rates of depression and anxiety. It doesn’t need to be high-intensity workouts, something as small as taking the stairs rather than the lift can help keep the body active. This links in with the top point but taking note of the people and the things around you is beneficial. Studies have shown that being aware of what’s going on around you enhances your well-being and can help reaffirm life priorities. It’s also great to ensure that you stop to think every now and then about the pressures of life, we find this is a great way to make positive choices based on your life. Other than encouraging social interaction and enhancing self-esteem, learning something new is great for concentrating on something and has been known to lift people out of depression when they begin doing something they’ve never done before. We’d recommend anything as simple as completing a Sudoku puzzle to something as taxing as learning a brand-new language. Keeping your brain active is a great way to improve your mental health. Of course, despite these recommendations, we’re not an authority in mental health, we’re only basing this off of what has helped us in the past. World Mental Health Day has been a huge success so far, and so many valuable advice pieces have been created. For more head over to the #WorldMentalHealthDay hashtag on Twitter. If you’re experiencing issues that you are finding difficult to deal with, it’s important that you consult a professional, whether it’s your local GP or a charity that specialises in helping those with mental health problems, such as Mind or The Samaritans.